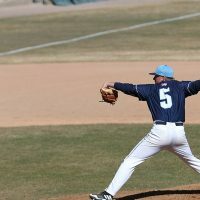 PRICE – Utah State Eastern Baseball will host their first home series of the season this weekend against conference leader Salt Lake Community College. The Eagles will finally get to debut at Carlson-Colosimo field after last weekend’s home series against Colorado Northwestern was canceled due to weather. USU Eastern is 1-7 overall and has yet to play a Scenic West Athletic Conference game this season. The four-game series against SLCC will begin with a doubleheader on Friday at 1 p.m.
On Saturday USU Eastern will play SLCC in another doubleheader beginning at noon. Fans that are unable to attend the game can watch the games on the Scenic West Digital Network at scenicwestnetwork.com.